Bellingham, Washington – Smart Box Design today is pleased to announce Farkle Solo HD Free 1.1.1 for iOS, a fun, fast-paced, customizable version of a popular dice game played with six dice. The goal of this Old West themed, exciting, quick tempo dice game is to score the most points in ten rounds to be the star of the saloon. Using classic Farkle Dice rules, players try to beat their best score or outscore friends. Farkle Solo HD – Free is available in the app store under the Games: Dice category for iPhone, iPad, iPod touch as well as for Android phones and tablets. In each round of Farkle Solo HD – Free, players roll all six dice in an effort to earn points with rolls of 1’s, 5’s, 3 of a kind, 3 pairs, or a 6 dice straight. Players pull scoring dice out of play and either pass and bank points or roll the remaining dice to earn additional points. If none of the dice rolled earn points, players get a “Farkle” and lose all unbanked points. Three “Farkles” in a row cause players to lose 1000 points. Risking multiple rolls can help players score big. Farkle Solo HD – Free allows game setting customization enabling players to turn on and off or adjust points earned for: 4, 5 or 6 of a kind, The Break In Score – or Minimum Score accepted, Three Pairs Score, Triple Farkle, and more. A comprehensive Game Stats board allows gamers to easily access their own scores and share scores with others on Facebook, twitter, or email, via the “Brag” feature. Compete against others and compare scores via Game Center’s Leaderboard. Farkle Solo HD – Free uses 100% dice randomization to prevent cheating. Each roll uses a robust randomization engineer-created algorithm. The Old West theme of Farkle Solo HD – Free, takes place in the High Roller Saloon and features rich graphics, smooth animation and fun music and sound effects that immerse the player in a world of high stakes dice in an old western town. The customization features and ease of game play make this the perfect game to play anytime. 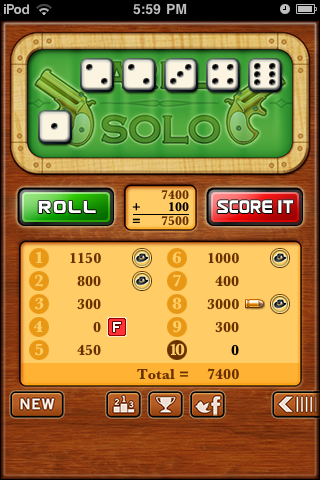 Players must employ risk taking and strategy to score big in Farkle Solo HD – Free. 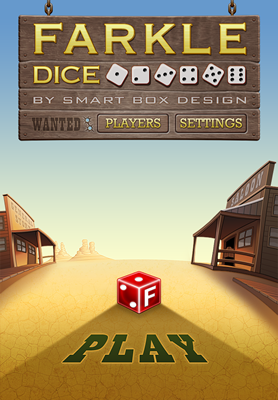 The game is featured among other dice and word strategy games offered by Smart Box Design. Farkle Solo HD – Free is perfect for that five-minute break or long commute. It can be played in just a few minutes or in a marathon session to improve skills and strategy. Farkle Solo HD – Free 1.1.1 is free and available worldwide exclusively through the App Store in the Games category. The game is also available for Android. Based in Bellingham, Washington. Smart Box Games was founded in 2003 focusing on primarily high quality mobile apps development. We’ve created several popular mobile thinking games for ourselves and custom apps for clients. Our client’s apps are varied and very interesting work. We also create the occasional web site for a client. Our senior staff is comprised of seasoned multimedia developers and executives who have years of experience in the game and education industry and have the gray hairs to prove it. Copyright (C) 2003-2012 Smart Box Games. All Rights Reserved. Apple, the Apple logo, iPhone, iPod and iPad are registered trademarks of Apple Inc. in the U.S. and/or other countries.